Gobekli Tepe — Paradise Regained? Göbekli Tepe, a megalithic monument in southeast Turkey, near ancient Harran and modern Urfa, has recently generated considerable excitement. It has several rings of large stones that remind visitors of Stonehenge, except that they are T-shaped; several of them also have fine relief sculptures of animals. What’s exciting is that the German archaeologists who excavated the site called it the world’s oldest temple. 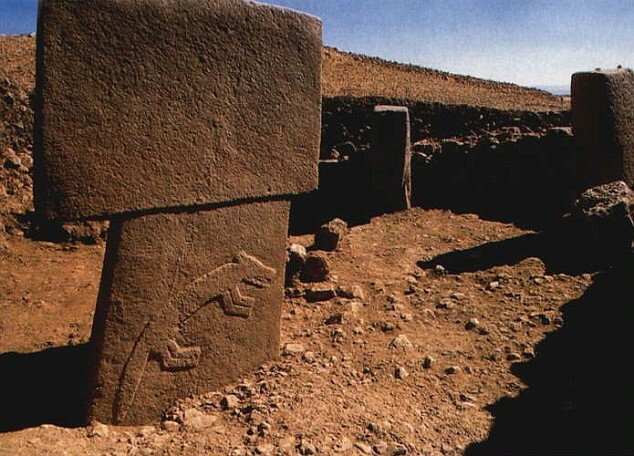 I’m not sure how one dates a carved stone, but they estimated Göbekli Tepe’s age at 11,500 years, give or take a millennium. Some folks have even speculated that ancient man built this temple to mark the site of the Garden of Eden. My response is that Mt. Ararat is about 350 miles away, and the Turkish candidates for Mt. Judi are even closer, but all the locations suggested for the Garden in Chapter 8 are farther away than that. Perhaps this is really an ancient temple to Noah and the Ark? It sounds much like the holiday of Sukkot, where Jews spend part of the day in makeshift shelters, to remind themselves of the forty years they spent in the wilderness, living in tents. Along that line, the church I used to attend in Florida once proposed that for the Sukkot celebrations of the Millennium (Zechariah 14:16), after God resurrects us, He will put us back in our old, mortal bodies for at least a day every year, to remind us of where we came from. I have also heard that Earth Hour has something to so with saving the earth, so if you cut the electricity, don’t light a candle; I hear that candles can produce up to ten times as much CO2 as an incandescent light bulb, over the same amount of time. Hmmm, for the past two years I’ve been replacing light bulbs around the house with compact fluorescents, as the old bulbs burn out; does that give me credit for anything? Anyway, the point is that whenever Earth Hour was, I missed it. All I have heard is that it was between 8:30 and 9:30 PM, sometime during the past weekend, but I don’t know what time zone was meant, or what day, because nobody turned off the lights in the places where I was. I also understand that the power companies in New York and California didn’t report any drop in electricity use; it was a normal weekend for them. Will somebody tell me how the environmentalists can call Earth Hour a success? These questions were actually asked of various park rangers across the continent. Unquote: I answered the last question regarding Mesa Verde in Chapter 2 of my history book. The Indians settled Colorado because it had a river running through a desert, making it the best place in the present-day United States to start a civilization. You probably won’t be surprised if I tell you that a lot of streets in this part of Lexington, KY are named after racing horses. Especially around the nearest shopping center, Hamburg Village, because a hundred years ago there was a racetrack on the site. One of those streets is Alysheba Way, next to the Meijer store. Now I have just heard that the original Alysheba, the 1987 Kentucky Derby and Preakness champion, has died. He had been living at the Kentucky Horse Park since last October, and suffered so badly after a nasty fall on Friday that he had to be euthanized, and was subsequently buried at the park. At least he got to see his homeland one more time; before he went to the Kentucky Horse Park, he had spent the previous eight years in Saudi Arabia, in King Abdullah’s stables. Judging by his reaction when he stepped off the plane, he definitely liked green hills better than sand dunes. Rest in peace, champ. I for one will remember you, every time I see the road sign with your name. Late last night, I completed a page of pictures and accompanying text, about the trip Leive and I took to Oklahoma, March 18-23. Called “The 2009 Prepaid Legal Convention,” it tells what we did at that event. Just click on the link below, or the one at the top of this page. Next I plan to do another page, featuring the rest of the pictures from Oklahoma City. Expect to see it in a day or so. I spoke too soon when I said that Lexington is done with basketball for now. You probably know how with the typical southern college, the best-known faculty member is the coach. Here the men’s basketball coach is not only the best-known faculty member, he’s the best-known person in the city! That was certainly the case with Tubby Smith, Billy Gillispie’s predecessor; even I recognized him on sight, and I’m more interested in politics than in sports. Just about everyone in town can name the coach, but how many can name the mayor? In other news, early this month I mentioned that our church is having an international festival on May 2, to raise money for missionaries, and this is largely Leive’s doing. Now it turns out that one of the big Baptist churches in town has been doing it for 35 years, and they held their latest festival, “Friendship International,” last Thursday. I am reposting the pictures which ran in the local paper, to show the competition we’re up against. Speaking of dancing, they had a belly dancing demonstration, too. However, I believe the newspaper was wrong when it said the dancer was from Taiwan; I’ve seen Lebanese girls who look a lot like that. Come back in five weeks and I’ll tell you how our festival went. Today is the first day of the month of Nisan, on the Jewish calendar. As far as we know, the Jews have always had a twelve-month calendar, but the original Hebrew names for the months have not been preserved, in the Old Testament or anywhere else. The names used now are Babylonian in origin; the Jewish calendar of today is exactly the same as the ancient Babylonian calendar, which they adopted during the captivity. That is why the month which falls in July has the pagan name of Tammuz, after a Sumerian king who became a fertility god (Ezekiel 8:14). Originally a new year began around the same time that spring began. This is no surprise, since the Iranians still celebrate Nowruz, their New Year festival, on March 21. Thus, the month of Nisan (March-April for us) was the first month of the year. This marked the beginning of Akitu, the twelve-day New Year festival which was the most important time of the year for the Babylonians. However, when the Jews returned to Jerusalem, the beginning of the year was moved six months, to Tishri (September-October), for reasons which escape me. Thus, if you’re Jewish, the next year is still six months away. For us, the beginning of Nisan means that Passover will arrive in less than two weeks. While you don’t have to clear the hometz (leaven) out of the house just yet, you probably shouldn’t buy any, the next time you go grocery shopping.